WHAT IS A ROTARY VALVE? WHAT IS AN AIRLOCK? WHAT IS A ROTARY AIRLOCK FEEDER? Rotary valves, airlock, rotary airlock, rotary feeders, rotary airlock feeder, what’s the difference? When do you use which term? Are they all the same thing? Terminology is important when discussing rotary valve applications. My goal is to help you differentiate these terms and know when and where the different functions of valves are required to do the job. 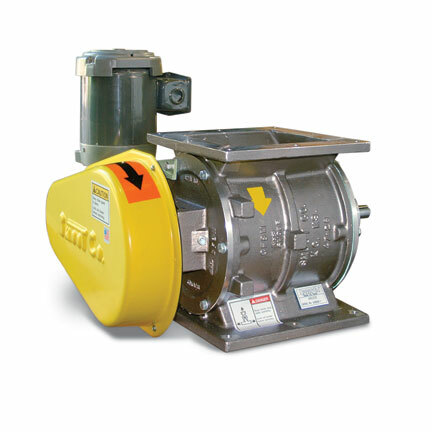 A Rotary Valve is a valve without a home, it’s not until you determine the application and accessories that are needed that make it an airlock, feeder, or both. An Airlock is a valve that separates a pressure differential sealing off airflow from a hopper, bin, or conveying line. In the pneumatic conveying world airlocks are usually found at the beginning of a pressure system or at the end of a vacuum system. Other components that could also be considered airlocks are knife gates, butterfly valves, double dump valves, venturi’s, OR a rotary valve. Once the valve starts to turn, it then becomes a Rotary Airlock that separates a pressure differential while material is passing through it. A Feeder is a valve or device that’s main purpose is metering material into or out of something but is not separating a pressure differential. These can be volumetric feeders, vibratory feeders, screw conveyors, OR a Rotary Feeder. A Rotary Airlock Feeder separates a pressure differential while allowing material to pass through it. Best way of thinking of how it works is imaging a revolving door in a building; it allows material to pass through, but maintains the pressure differential between the building and outside. Rotary Airlock Feeders leak air by their inherit design and are not the most accurate metering device but it is the only type of valve that will accomplish both at the same time. All of the valves will look the same but the application makes a big difference in how the proper size and options are selected to provide the best valve for various industries and applications. I hope this was helpful, be on the lookout for more helpful tips about rotary valves and pneumatic conveyance systems. Have you downloaded the Smoot Sizing App yet? Use the app to help determine the correct valve for your application directly from your phone or tablet. For more information on Smoot Rotary Valves Click Here.